Cork boards are endlessly useful around the house. Not only can they hold reminders, they can also display precious mementos and photos. But you don't have to pay for pricey designer looking versions, you can just make your own! It's quick, easy, and only requires a few simple supplies. These supplies are all easy to find at your local craft store, even a plain piece of cork board. And don't worry—it shouldn't be no more than 10 dollars. The more simple the style, the less expensive it will be. For this project we preferred the version with a wooden frame going around the cork for a more finished look. Using craft paint in a color that will complement your fabric, carefully paint the entire wood frame. To ensure the best possible job, try to paint in one direction and do light coats of paint, waiting between each layer so you don't pull up chunks of dried paint. Repeat until you're happy with the color—the darker the color you choose, the easier it will be to cover the wood quickly. This took us only two coats. Allow the paint to dry completely before moving onto the next step. Almost any fabric you buy will inevitably have those deep creases in it. You'll want to pull out your iron and do the best you can to smooth the fabric. It serves two purposes: one is to make sure that you're cutting even pockets, and two is to make sure it looks good once it's glued to your cork board. Tip: If you're dealing with impossible-to-iron creases, use the steam setting. The mist of water helps smooth even the most stubborn folds. Take your fabric and felt and carefully cut out pockets with your scissors or pinking shears. We chose to do one large bottom pocket and two smaller pockets on top. Layering two colors or a color and a pattern on the upper pockets give a nice custom touch. Use your best judgement based on the size of your cork board and what you'll be using the board for. Pinking shears are a great tool to have because they help to prevent fraying when you cut fabric. Figure out where you want to place your cloth pockets. Using fabric glue, run a thin line around three sides of each square. You want to leave one side open without glue; this will be the top of each of your squares. Carefully glue your pockets to the cork board. Run your finger over the line of glue to make sure there are no gaps or air pockets. Let the pockets dry completely before filling them up with all of your supplies. 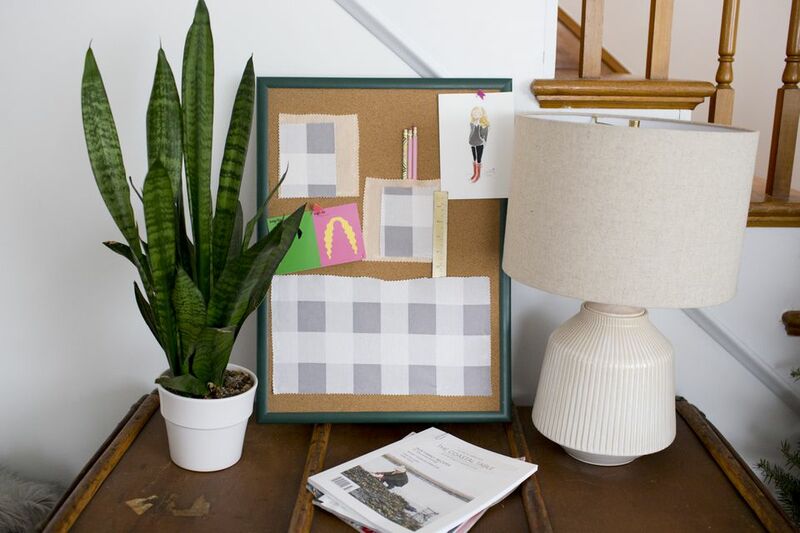 Cork board doesn't have to be plain and boring, a bold pop of paint and some sweet fabric pockets can turn a plain office staple into a must-have accessory.